Aviation History Begins In Greene County | The Jamestown Comet. (FAIRBORN) – For those looking to save money on vacation this season, consider staying closer to home. Day and weekend trips to local attractions can save hundreds and provide a fun, educational experience for the whole family. The Dayton area offers many such locations and many are free to visit. One particular jewel in the Gem city’s historic crown is the Dayton Aviation Heritage National Historical Park. Comprised of multiple attractions, the park system includes homes and workshops of the Wright Brothers as well as related figures including poet Paul Lawrence Dunbar. Most of the sites are located in or near Dayton proper, but, apart from the work done at Kitty Hawk, North Carolina, most of the actual flying and development actually took place in Greene County. Perched atop a hill at the corner of SR 444 and Kauffman Avenue in Fairborn is the Wright Memorial. The hill overlooks Huffman Prairie, where the two aviators developed many of the innovations of powered flight following their success at Kitty Hawk in 1903. At the Huffman Flying Field Interpretive Center at Wright Patterson Air Force Base, visitors can see exhibits and films about the importance of the area to modern aviation. Upon completing their experiments in North Carolina, Wilbur and Orville returned to Dayton to find a suitable location to perfect their new aircraft. A Dayton area banker named Torrence Huffman owned a field situated about eight miles northeast of the city where he kept horses and cattle. Huffman offered the field to the aviators on the sole condition that they keep the gates closed so that his livestock would remain in the pasture. Huffman Prairie, as it later became known, was flat, open and bordered along the north by the Urbana Electric Railway system. The trolley depot at Simms Station, near the prairie, allowed for easy transport of tools and equipment. The Wrights had no way of knowing that less than a decade later, this would become location of the world’s first airport and aviation school. From 1904 until 1905, the Wright Brothers had developed a flying machine capable of controlled, sustainable flight, but the task had not been without its problems. The tree line surrounding the field often created unpredictable wind drafts, thus making take off and landing problematic for the fledgling airplanes. At the end of 1905, the men moved from the site and did not return until 1910 when they built a permanent hangar and aviation school after obtaining a patent for their new invention. Today the field is part of the national park in their honor and now situated at the end of one of the busiest military runways in the world at Wright-Patterson Air Force Base. Flying over Huffman Prairie, the birthplace of modern aeronautics, are some of the largest and most complex flying machines ever devised by mankind. 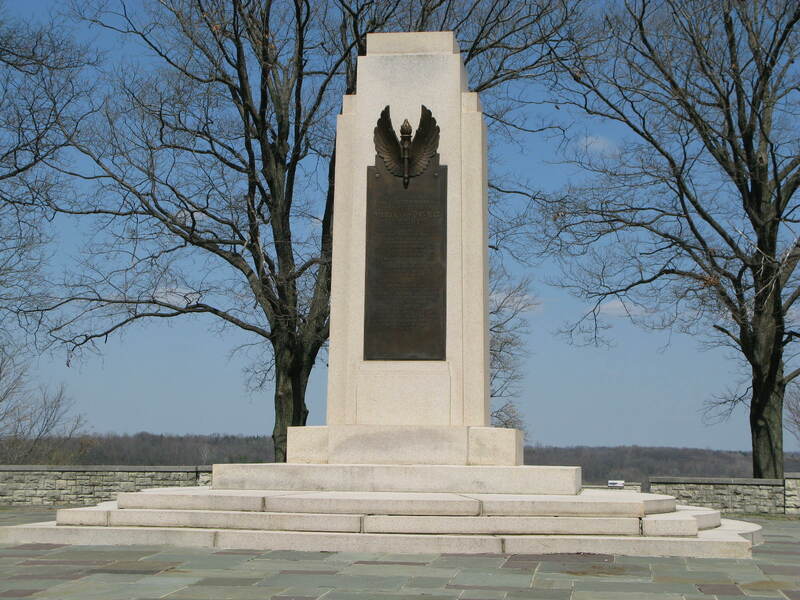 As a tribute to the accomplishments of the Wright Brothers, the Wright Memorial was erected in the middle of a 27-acre parcel of land in 1940. Originally planned for construction in 1913, the project was put on hold because of the great flood of that year. In 1938, a revised plan was undertaken on land owned by the newly-formed Miami Conservancy District. Overlooking the Huffman Prairie Flying Field, the memorial was dedicated on August 19, 1940, Orville Wright’s 69th birthday. Though Wilbur had passed on, his brother and several of their flying students were on hand for the ceremony. The site today includes the monument and plaza, a scenic overlook, a series of Native American burial mounds and an interpretive center. The monument is a 17-foot obelisk made of pink, North Carolina granite. The material was taken from the same quarry as that used in the Wright Brothers National Memorial in Kitty Hawk. A bronze plaque on the face of the monument notes the accomplishments and dedication of the monument, while four smaller ones adorn columns at the entrances to the plaza area. Each plaque commemorates an historic attribute of the site including its prehistoric significance. Surrounding the monument is a circular plaza. The site was also important to the Native Americans known as the Adena, who lived in the region between B.C. 500 and 200 A.D. Several burial mounds of various sizes are easily spotted by even the most amateur archeologist. In 1974, The Wright Brothers Hill Mound Group was placed on the National Register of Historic Places for its archeological significance. The Wright Memorial and Huffman Prairie Flying Field Interpretive Center is located at 2380 Memorial Road, Wright-Patterson Air Force Base. Visitation hours are 8:30 a.m. to 5:00 p.m. daily. Hours are extended to 6 p.m. daily from Memorial to Labor Day and the facility is closed Thanksgiving, Christmas Day and New Year’s Day. In addition to the Wright Memorial, there are several other Wright-related sites in the Dayton area including the Huffman Prairie Flying Field, The Wright Brothers Aviation Center, the Wright Cycle Company, and the Wright-Dunbar Interpretive Center. The sites are easy to find and most are free to visit, including the Wright Memorial, or require a minimal donation. For more information visit the U.S. National Parks Service website http://www.nps.gov/daav or call the Huffman Prairie Interpretive Center at (937) 937-425-0008.